Audit Report of local Audit Department for the year 2016-17 annotated reply thereof. 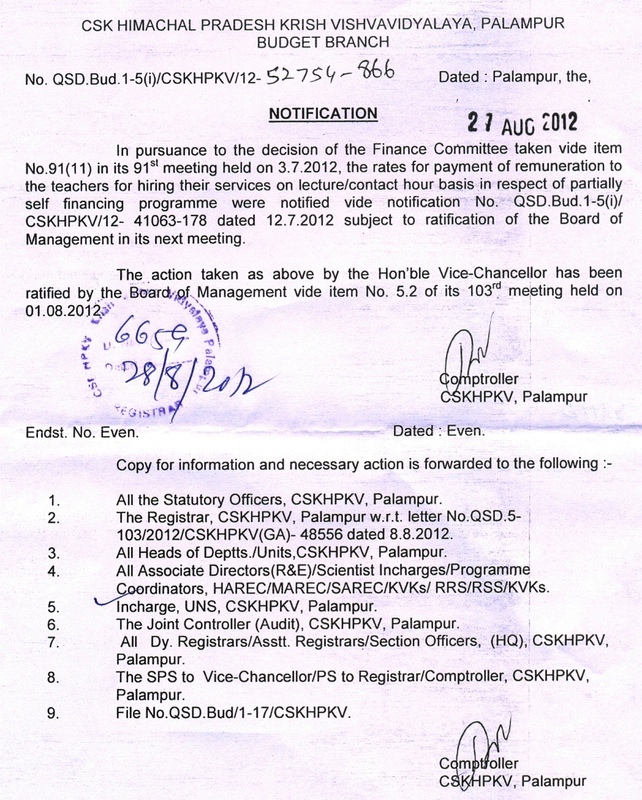 Notification regarding New Pension System. 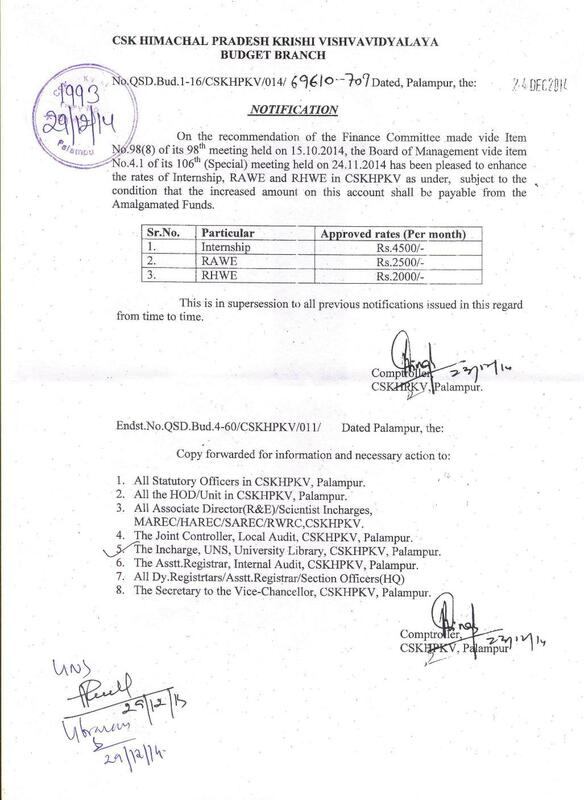 Notification regarding Payment of Pension / CPS, Leave salary and DCRG contributions. 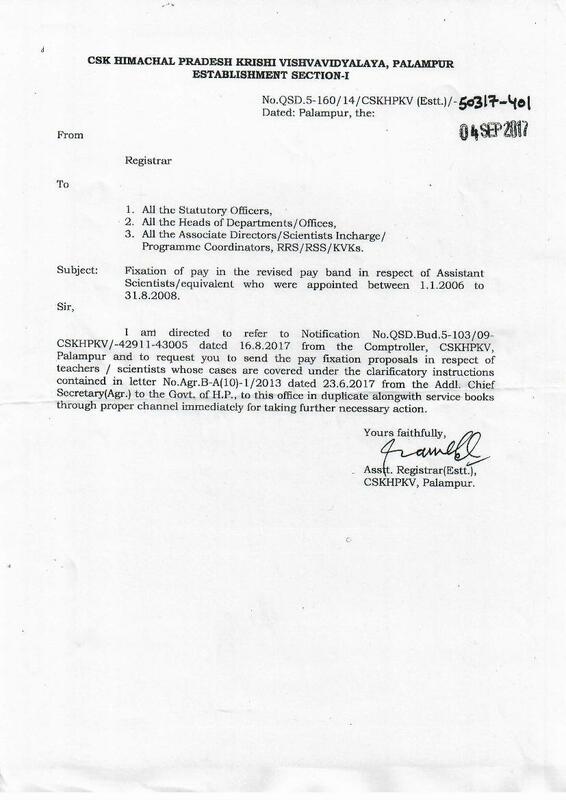 Deletion of Para no's 6(iii), (iv) and (vi) of the guidelines regarding revised Pay Scales, Pay structure etc. Notification regarding discontinuation of Public Provident Fund being deposited by the University in the Post Office and Bank - collection of passbooks and depositing the premiums at individual level thereof. Notification Regarding enhancement rate of Dearness Allowance from the existing rate of 119 % to 125 %. Notification Regarding enhancement in the emoluments payable to the employees working in contractual basis. 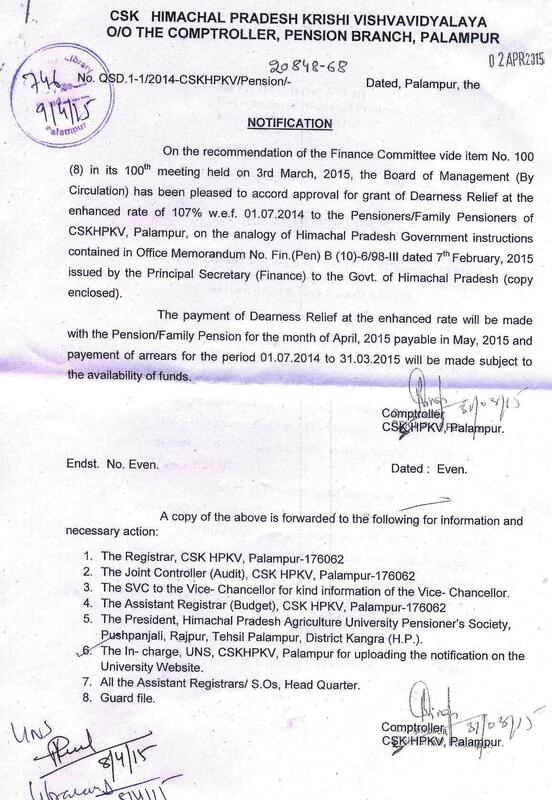 Notification Regarding the monthly contribution towards cost of pension Payable during foreign service w.e.f 01.01.2016 on analogy of H.P.Govt as notified by the under Secretary (Finance) to the Himachal Pradesh . Ex-gratia grants for families of contractual employees who die while in service. Notification regarding enhance the rate of Dearness Allowance from the existing rate of 113% to 119% w.e.f. 01-07-2015 to the employees of the University. Notification regarding enhance the rate of Dearness Allowance from the existing rate of 107% to 113% w.e.f. 01-01-2015 to the employees of the University. 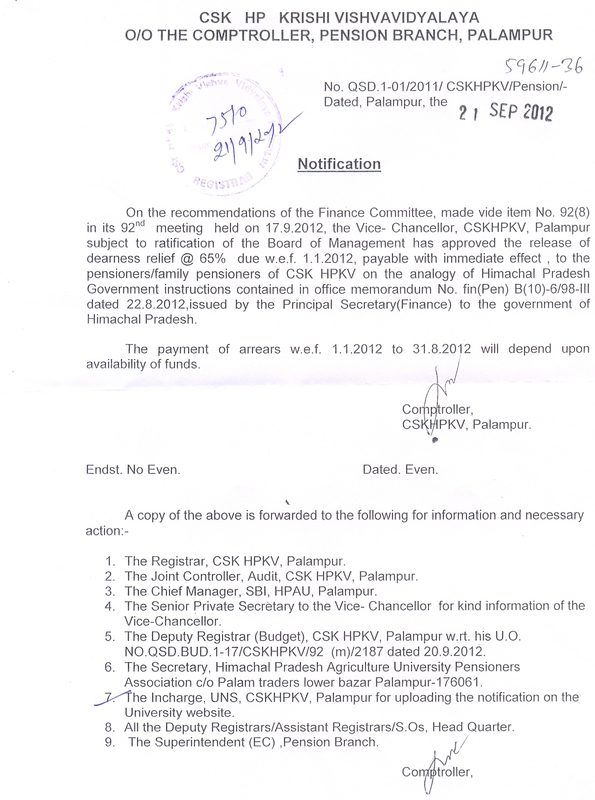 Adopted the New Pension System (NPS) Architecture under Pension fund Regulatory and Development authority in CSK HPKV. Instructions regarding compassionate appointment - adoption thereof. 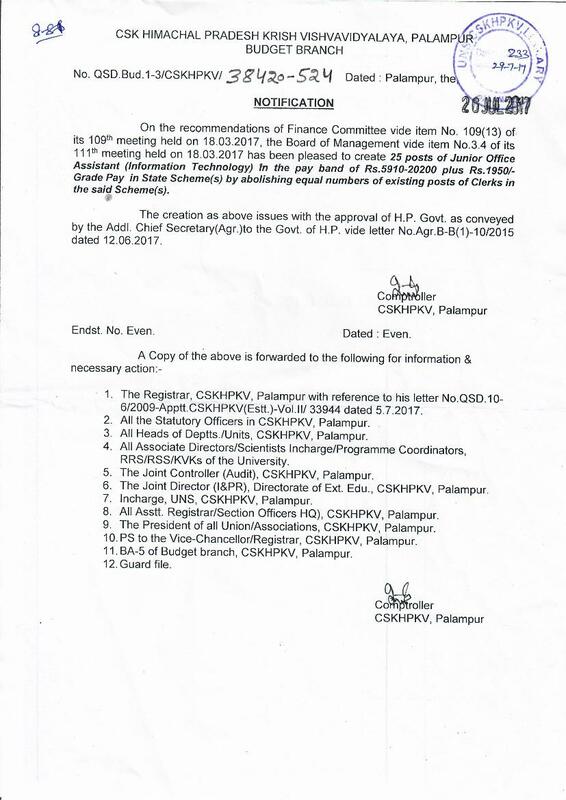 Notification regarding grant of one additional increment to all class-IV employees on completion of 20 years of regular service, as such in CSKHPKV. Notification regarding enhance the rate of Dearness Allowance from the existing rate of 100% to 107% w.e.f. 01-07-2014 to the Pensioners/Family Pensioners. Notification regarding enhance the rate of Dearness Allowance from the existing rate of 100% to 107% w.e.f. 01-07-2014. 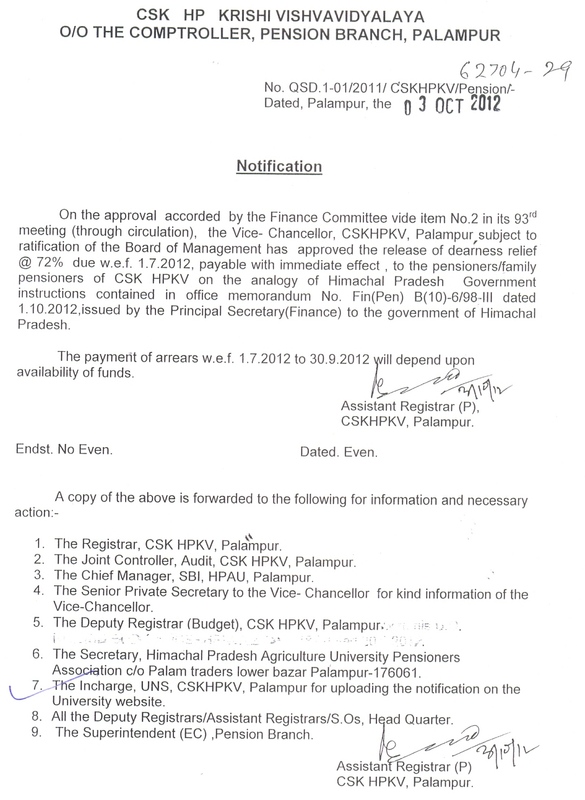 Notification regarding enhance the rate of internship, AWE and RHWE in CSKHPKV. Notification regarding enhance the rate of fixed medical Allowance w.e.f. 01-04-2014. Notification regarding enhance the rate of Dearness Allowance from the existing rate of 90% to 100% w.e.f. 01-01-2014. Notification regarding enhance the rate of Dearness Allowance from the existing rate of 80% to 90% w.e.f. 01-07-2013. Renewal - the Indexed Group Personal Accidental Insurance Scheme for Regular, Adhoc, Part-time, contractual and Daily Wages Employees of Govt. Departments, Boards, Corporations, Universities and Autonomous Bodies on compulsory basis. Notification regarding enhance the rate of Dearmess Allowance from the existing rate of 72% to 80% w.e.f. 01-01-2013. Notification regarding enhance the rate of Dearness Allowance from the existing rate of 72% to 80% w.e.f. 01-01-2013 to the Pensioners/Family Pensioners. Appointment (s) on compassionate grounds to be made as per the decisions (s) direction (s) of the Hob'ble Court (s) Latest instruction (s) thereof. Introduction of New Assured Career Progression Scheme on Completion of 4-9-14 Years service. Notification regarding enhance the Grade - HP Civil Services (Category /Post wise Revised Pay ) Rules, 2012 & HP Civil Services (Category /Post wise Revised Pay ) Rules, 2012 - Schedule for Common Categories/Posts. Notification regarding enhance the rate of Dearness Allowance from the existing rate of 65% to 72% w.e.f. 01-07-2012 to the Pensioners/Family Pensioners. Notification regarding enhance the rate of Dearness Allowance from the existing rate of 65% to 72% w.e.f. 01-07-2012. 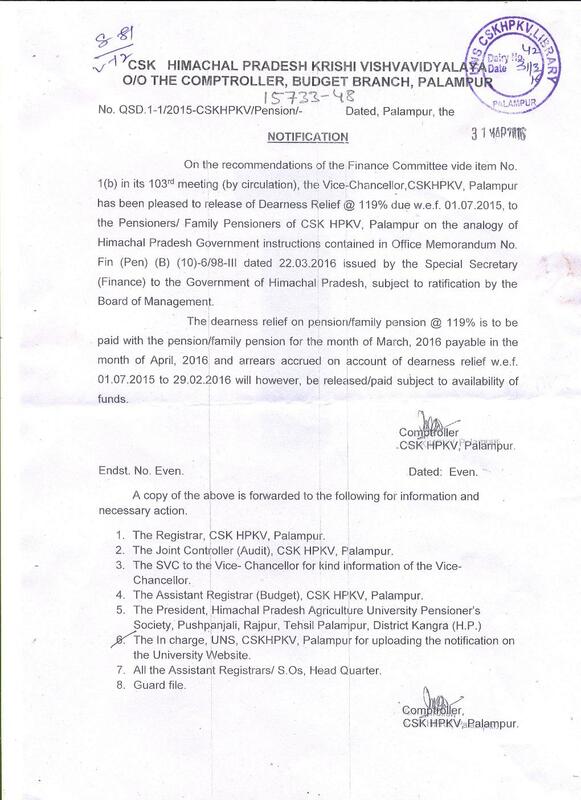 Notification regarding to enhance the rates in respect of various categories of workers engaged on daily wages and part-time basis in CSKHPKV Palampur. 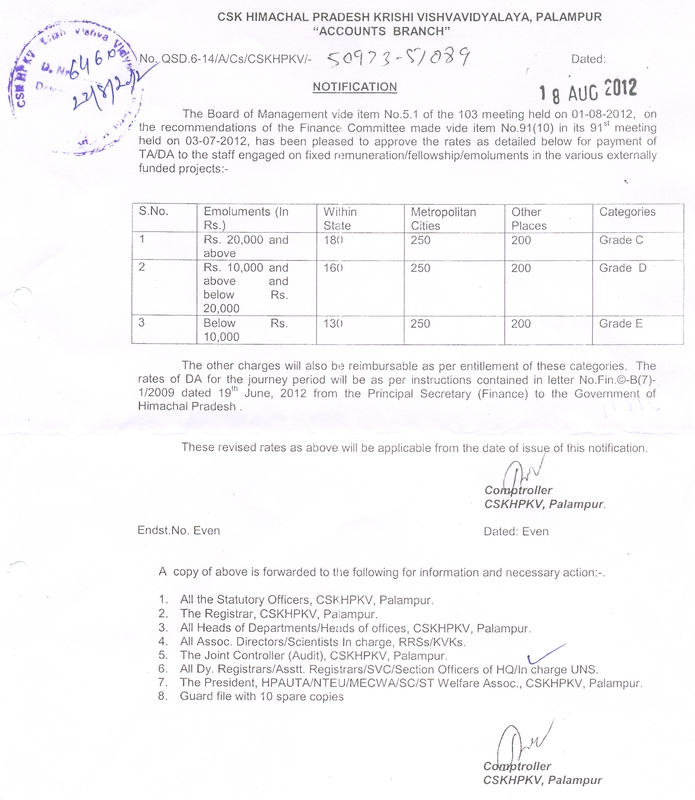 Notification regarding to grant benefit of one additional increment to Class IV employees working in CSKHPKV, Palampur on completion of 20 years. Notification regarding enhance the rate of Medical Allowance from Rs. 100/- PM to Rs. 250/- PM. 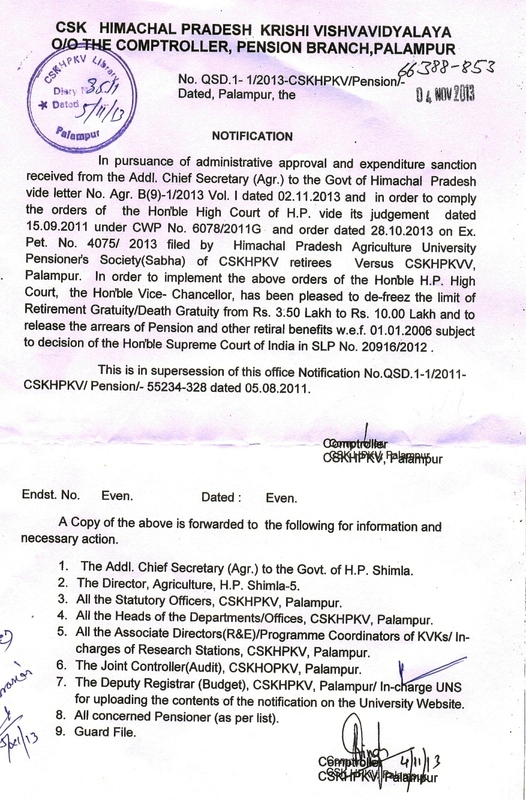 Notification regarding enhance the rate of Tribal Allowance from Rs. 200/- PM to Rs. 300/- PM. Notification regarding enhance the rate of Dearness Allowance from the existing rate of 58% to 65% w.e.f. 01-01-2012 to the Pensioners/Family Pensioners. Notification regarding enhance the rate of Dearness Allowance from the existing rate of 58% to 65% w.e.f. 01-01-2012. Notification regarding "BETI HAI ANMOL"
Notification regarding EX-GRATIA GRANT TO THE FAMILIES OF GOVERNMENT EMPLOYEES WHO DIE WHILE IN SERVICE. Notification regarding payments of TA/DA etc.